Aqua Data Studio is a database integrated development environment used by database developers, database administrators, and analysts to develop, access, manage, and analyze data. This productivity software is developed by AquaFold together with other innovative software solutions and tools for software professionals. Aqua Data Studio can handle different types of databases, such as relational, nosql, and cloud database. Supporting all the major database vendors and operating systems, the software is trusted by many IT professionals, large corporations, educational institutions, and companies in a variety of industries. Aqua Data Studio is a universal IDE for databases, allowing the effortless designing, administration, and automation of the latest types of databases. It permits users to explore and analyze data through the aid of beautiful visualizations and dashboards that they can create and share with their colleagues. Aqua Data Studio has an advanced query and analysis tool that enables users to connect to any database server and write SQL statements automatically. With its table data editor, users will be able to easily alter table data with a grid similar to Excel. The database IDE also delivers a set of integrated SQL debuggers for tracing and debugging stored procedures, functions, and packages. Aqua Data Studio features a tool which makes searching for database objects a breeze. To reverse engineer existing databases and design detailed physical database models, it provides a tool called ER or Entity Relationship Modeler. Furthermore, Aqua Data Studio offers a suite of database administration tools which are customized for various database vendors. The software also comes with interactive shells that automate database tasks. The other features included in Aqua Data Studio are version control, compare and synchronization tools, import and export tools, Secure Shell Environment, and open APIs. Aqua Data Studio is a modern database IDE that provides users with a workspace environment to streamline and automate the administration and designing of databases, regardless of their type or class. This workspace environment enables them to organize and navigate through query windows, files, and documents with flexibility. Visual analytics is among the noteworthy features available in Aqua Data Studio. Designed with an easy-to-use drag-and-drop interface, Aqua Data Studio lets users create different visual representations of data by pulling in query results and aggregating datasets into individual pages which are referred to as worksheets. These worksheets then together with the visual representations that comprise them can be placed on dashboards that provide a single and summary view of the worksheets. The layout of the dashboards can also be customized and their content can be filtered, making them more interactive. These dashboards can be shared with colleagues and customers, and worksheets can be saved in workbooks so others can explore and analyze data. Aqua Data Studio is built with query and analysis tools which permit users to connect to database servers and create and execute queries effortlessly. One of these tools is its powerful visual query builder which enables them to construct SQL queries without the need of typing any SQL statements. In addition, they will be able to directly select tables or views directly from Aqua Data Studio’s UI using column selection options. A rich set of visual options are also provided in order for users to combine SQL properties which include JOINs, indexes, operators, aliases, and criteria. Another query and analysis tool offered by Aqua Data Studio is its advanced query analyzer. This tool helps users save time in writing SQL statements. It has the capability to automatically insert frequently used SQL statements in a code such as select, deselect, or insert. Through its SQL abbreviation feature, users can define SQL abbreviations to automatically complete lengthy blocks of SQL statements with just a few keystrokes. The query analyzer delivers a feature called Pivot and Charts which assist users in quickly analyzing large amount of table data and generating graphical representations of datasets. Aqua Data Studio is equipped with a powerful table data editor that has grid editing features and functionalities similar to Excel. Users will be able to fill, copy or paste, or find and replace cell data like how they do it in Excel. The table data editor also checks whether the entered data has the proper format based on its type. In addition, color codes are applied to cells as users edit table data. This way, they can easily track the changes they have made. To quickly search for objects within a database, Aqua Data Studio introduces a tool named as Object Search Tool. With this tool, database objects can be searched based on type, schema name, object name, column name, index columns, constraint columns, trigger columns, or systems objects. Search results can also be filtered and sorted. As users browse database objects, Aqua Data Studio lets them visually edit these objects. Aqua Data Studio comes with an ER or Entity Relationship modeler which is used to build and manage ER diagrams and physical database models. It supports the creation of physical database models for all major RDBMS or Relational Database Management System vendors and versions. The modeler permits users to reverse engineer existing databases so they can generate and visualize database structures and models. They can import tables and views from databases to their ER models as well as compare two ER models. The ER modeler can also forward engineer models into databases. Thus, ER diagrams are converted into DDL or Data Definition Language scripts. The database IDE provides compare and synchronization tools which enable users to identify the differences in DDL between two schema objects from different databases. Through the aid of a color-coded grid, they will be able to quickly view the differences between schema objects. Differences can be deployed from the source schema to the target schema, allowing synchronization between the two schemas. Additionally, the results of the schema comparison can be saved as an HTML report. Aqua Data Studio is built with interactive database shells which make the administration of databases a breeze. One of these database shells is the FluidShell, a database shell which integrates the functionality of a Unix shell with the SQL command line. As a result, it enables users to automatically extract, transform, and load data from a single database shell. Summing it up, Aqua Data Studio offers integrated SQL debuggers for Oracle, IBM DB2 UDB, Microsoft SQL Server, and Sybase ASE. With these debuggers, users can debug stored procedures, functions, and packages. They will be able to easily assess the variables and conditional flows of codes by setting breakpoints and using stepping functionalities – step into, step over, and step return. If you are interested in Aqua Data Studio it could also be sensible to examine other subcategories of Best IDE Software listed in our database of B2B software reviews. Every company has its own characteristics, and may need a particular type of IDE Software solution that will be adjusted to their business size, type of customers and staff and even particular niche they deal with. You should not count on finding a perfect app that is going to be suitable for each business no matter what their background is. It may be a good idea to read a few Aqua Data Studio reviews first and even then you should keep in mind what the service is supposed to do for your company and your employees. Do you require an easy and straightforward solution with only basic functions? Will you really make use of the complex tools needed by experts and large enterprises? Are there any particular tools that are especially beneficial for the industry you operate in? If you ask yourself these questions it will be much easier to get a solid software that will match your budget. 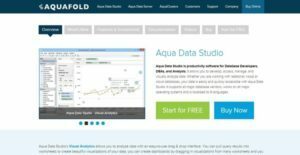 How Much Does Aqua Data Studio Cost? We realize that when you make a decision to buy IDE Software it’s important not only to see how experts evaluate it in their reviews, but also to find out if the real people and companies that buy it are actually satisfied with the product. That’s why we’ve created our behavior-based Customer Satisfaction Algorithm™ that gathers customer reviews, comments and Aqua Data Studio reviews across a wide range of social media sites. The data is then presented in an easy to digest form showing how many people had positive and negative experience with Aqua Data Studio. With that information at hand you should be equipped to make an informed buying decision that you won’t regret. What are Aqua Data Studio pricing details? What integrations are available for Aqua Data Studio?